The Ashtead medium Art Nouveau Tiffany 3 light inverted pendant, with a floral border of autumnal colours made from mottled glass, enhanced by highlighted dark bronze finish fittings. A lovely elegant handmade Art Nouveau style floral Tiffany pendant light. A stunning design depicting autumnal flowers around the shade rim, rendered in beautiful mottled art glass, with shades of brown, green, purple, orange and red. The shade body has panels of amber cream, with three bands of rippled art glass in shades of purple and green that will sparkle when illuminated. The neutral base colour allows the vibrant hues to really stand out. The 41cm inverted uplighter shade is suspended from a dark bronze finish ceiling rose and three chains. Height adjustable at the time of installation only, minimum height 44cm, maximum drop 66cm. 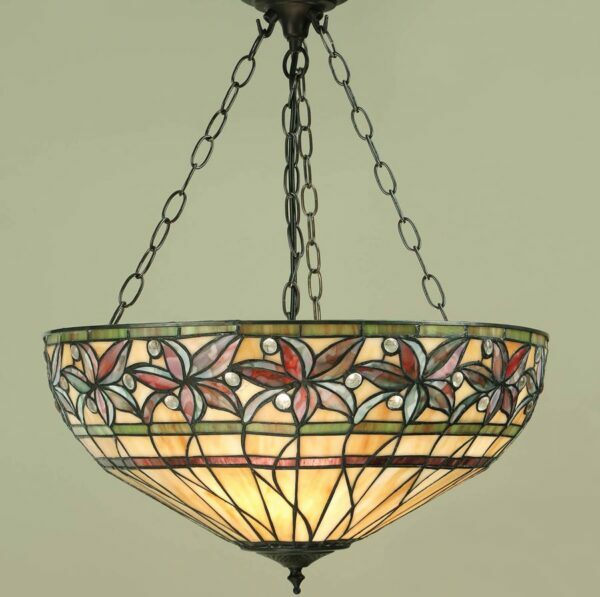 A wonderful Art Nouveau floral design inverted Tiffany pendant light, hand crafted using art glass that will transform any room whether lit or not.